The Solatube when combined with a ventilation add-on kit is perfect for bathrooms and butlers pantries. It can extract up to 53 litres of air every second, all while being much quieter than standard fans, since the fan motor sits up in the roof, rather than fixed directly to your ceiling, like most other extraction fans. This means that you can maintain a normal conversation even while the fan is going. You will no longer have to shout over the noise. The shower is one of the most peaceful places in our home. It is a place where no one bothers us. It's just us and the water…and the noisy bathroom fan. Say goodbye to noise with the Solatube with a Ventilation add-on kit. The fan within this ventilation system is located in the roof, rather than fixed to your bathroom ceiling, like most other extraction fans. This means that the noise from the fan stays in the roof, making for a supremely quiet room. Whether you've got a teenager who loves their body spray, or you're the type who hides food and dishes in the pantry while you have guests over, the Solatube with ventilation add-on kit can clear those smells quickly so they don't linger for days. 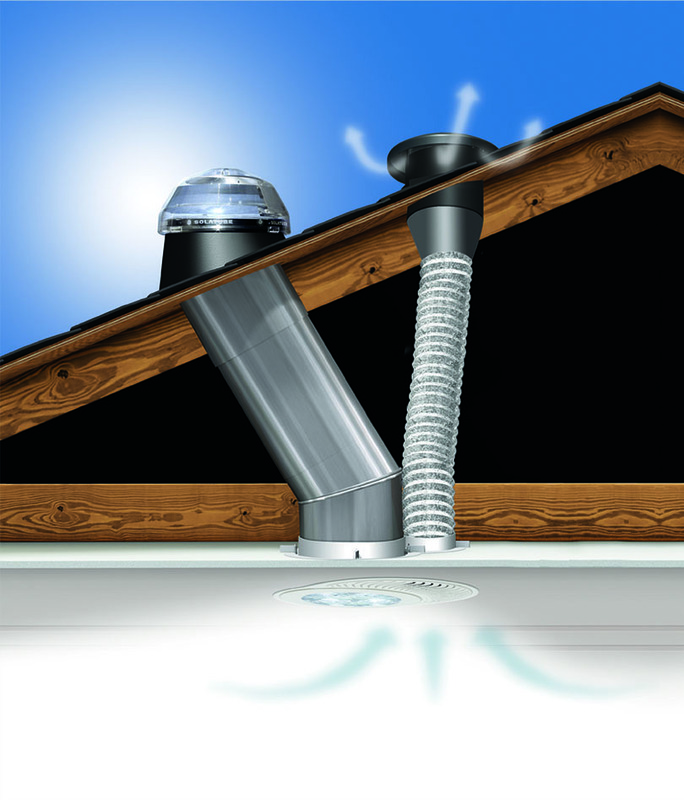 A Solatube with the add-on ventilation kit can serve three uses, while only needing one fitting in the ceiling. It provides natural light during the day, extracts moisture and smells, and can even be fitted with an electric light add-on kit that you switch on for night time use. See how the Solatube range could work for you. Every Solatube comes with a 10 year warranty on materials and the workmanship. Rest assured, if your Solatube encounters any issues within this period we will repair or replace the product at no cost to you. It's the right thing to do. Ready to let the light shine in? To see whether a Solatube is right for you in your home, we want to offer a free in-home consultation where a certified installation consultant will assess where a Solatube can be installed in your home. Otherwise, check out the standard Solatube Daylighting System.